bebop spoken here: Preview: Davina & the Vagabonds return to Sage Gateshead! Preview: Davina & the Vagabonds return to Sage Gateshead! Quick! 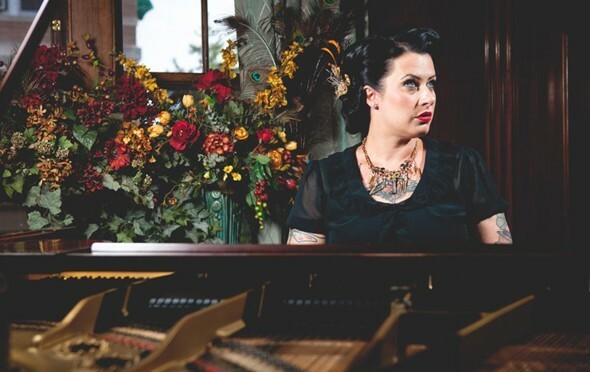 Tickets are flying out the door for Davina and the Vagabonds' late night SummerTyne Americana show. It's exactly four years to the day (July 20, 2014) that Davina Sowers (now Davina Lozier) played a killer set on the Jumpin' Hot Club outdoor stage. On that occasion Davina made a huge impression, a lasting memory is of the Twin Cities' musician belting out I'd Rather Go Blind. The following year Davina returned to Sage Gateshead to play Gateshead International Jazz Festival. Bebop Spoken Here's Editor in Chief was there and was suitably impressed! Now, three albums later - 2011's Black Cloud, 2014's Sunshine and the 2016 live album Nicolette and Tenth (I'd Rather Go Blind is on it!) - Davina is to play a late night show (10:30) tomorrow evening (Saturday) in Sage Two. A red hot band, N'Awlins' street savvie, a Memphis dirty blues feel, first rate musicianship and...Davina. Presence, star quality, great voice, this is one gig that you simply must not miss! To bag one of the last few tickets call Sage Gateshead's ticket office on 0191 443 4666.